Hartex has full Loco Drop Tables designed to accommodate one, two and three axle bogies. These drop tables may also have a split service top to accommodate single axle removal. The jack nuts are guided and lubricated through the entire stroke to maximize the wear life. The control of the table is through a PLC, which is programmed for automatic operation. The precise positioning of the drop table is automatically monitored, thereby providing the operator with maximum convenience and decreasing the wear and tear on the drive mechanism, designed for many years of reliable, safe operation. Hartex single axle drop tables are designed for rapid change out of locomotive combination wheel set and motor assemblies. 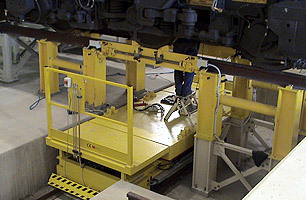 These drop tables are capable of operating with multiple service tops. Control systems utilize PLC for integration of interlocks to provide maximum operator and machine safety. Automatic lubrication systems also maximize lift system component longevity. The service top is designed with an elevated rail section for easy access to the locomotive truck assembly. A locking system supports the service top when the drop table carriage is not in position. 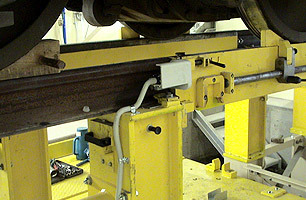 Lock bars transmit crossover loads to the pit walls so that the drop table carriage is never subjected to this crossover loading. 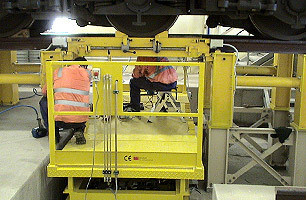 Single-axle service tops may be provided with a traction motor dolly to support and align the traction motor frame during change-out. Large diameter rollers allow the dolly to be easily positioned and a latch mechanism holds the dolly in position. 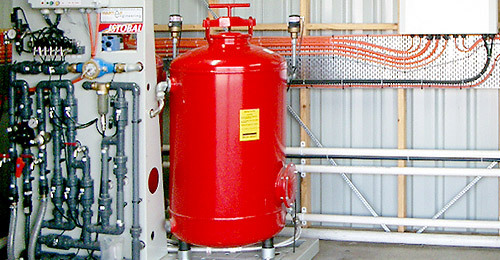 The hydraulic cylinder uses a 110V power pack. 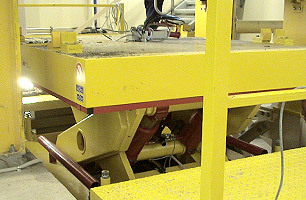 The carriage drive system uses scissor arrangement hydraulic cylinders to raise and lower the drop table. 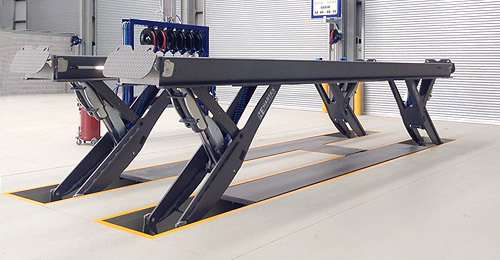 The hydraulic cylinders are located within the scissor arm mechanism and offers reduced underground accommodation than traditional screw type drop tables. 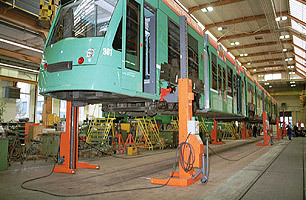 Release tops are used to cover the area where the dismounted bogie set or axle is raised through the shop floor. They can be located on one of the shop tracks so the bogie can be rolled to a wheelset repair area. 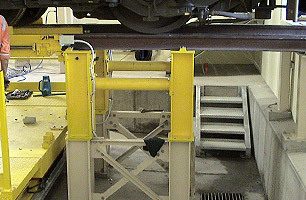 Release stops that are located on a shop track location may be designed to accommodate the rollover load of a locomotive passing through the shop. Body stands support the locomotive during the truck change-out procedure. 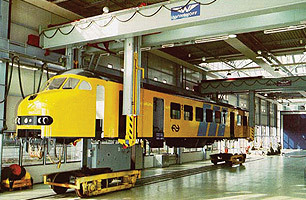 The body stand may be moved parallel to the locomotive for easy jacking pad positioning. 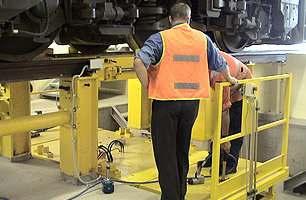 The body stand support pad be manually raised and extended to ensure proper contact with the locomotive jacking pad. These systems utilize PLC control to allow the operator to select the destination of the drop table. Once the travel is initiated, the drop table smoothly accelerates to full speed, travels until the stop is within range, decelerates to a creep speed and stops in position at the centre of the selected track. 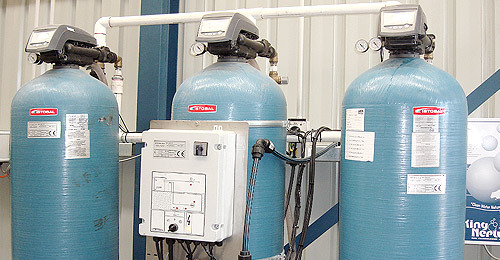 These systems are typically custom-designed and manufactured to meet the specific needs of each customer, which provides engineers, designers and facility owners with a wide range of options. and continue to operate smoothly and quietly day in and day out. assistance and the detailed technical support needed to integrate its equipment into the overall installation. This support includes providing foundational, electrical and control requirements, trim details, data for structural analysis and any other assistance the project requires. Hartex provides a specially trained field engineer or technician to supervise the installation, start-up and commissioning of its equipment, ensuring that it is brought on-line quickly and delivers the expected performance. Hartex also provides long-term spare parts and technical support services. 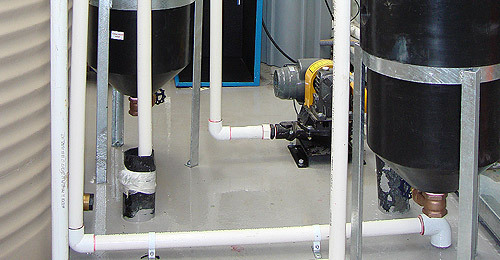 Long-term service contracts are also available at each of these installations for periodic inspection and maintenance programs, as well as training services, as needed. In addition, Hartex provides customers with the ability to easily upgrade their control panels, drives and other systems to ensure they reflect the latest in technology.